Although my takes on the players in the next series of posts might be useful to fantasy owners, these aren’t fantasy football articles. I’m not projecting stats. I’m writing about talented players whose portfolio of work reveals techniques and behaviors that I think translate well to the NFL game. At the end of the year, you might look at the stats and conclude that the quantity of the production wasn’t eye-catching for each of these emerging talents. However, I believe their work will be impressive enough for opposing teams, fans, and more astute fantasy owners to take future notice. Below are the career stats of every starting running back (not counting short-term subs) for the Green Bay Packers since former running back coach Edgar Bennett was himself a Packers running back. Look at the stats of these four runners and see if you can find a broad pattern when it comes to the team’s organizational decision-making. For those of you who didn’t see the pattern (or just skipped to here for the answer), the common thread between each Packers running back is the circumstances surrounding how each passed the starting baton to the next. Edgar Bennett’s best year was 1995. The next year, Bennett split time with Dorsey Levens. The following year, Bennett missed the season with an injury and Levens had a career year. Levens got hurt in 1998, bounced back in 1999, and then got hurt again in 2000. Then the recently acquired Ahman Green posted 1175 and 10 scores. This sparked Green’s run of five seasons with at least 1150 yards and 7 touchdowns, including a combined total of 2250 yards and 20 touchdowns in 2003. In 2005, Green ruptured a tendon and Samkon Gado, a free agent from Liberty, carried the load until Green returned in 2006. Green had one final 1000-yard season before giving way to Ryan Grant’s 956 yards and 8 touchdowns in 2007. Grant then posted consecutive 1200-yard seasons before losing most of 2010 to injury. Recent history has shown that the Packers tend to find a capable running back of the future who takes the reigns within a season or two after the incumbent starter suffers a season-ending injury. The incumbent might rebound the next year, but generally the writing is on the wall that his time in the sun is nearing its end. I’m not detailing this history to proclaim this trend as a natural law of Wisconsin pro football. As far as I’m aware, there’s no precise algorithm behind it. I’m just examining common sense from an unusual angle. Most starting running backs have 3-5 quality seasons before they lose the job to a new starter. Depending how one judges a quality season, Edgar Bennett had three or four. Dorsey Levens had three. Ahman Green had six. And thus far, Ryan Grant has three seasons. In other words, the end is likely near for Grant’s career as an NFL starting running back. He may even rebound this year. 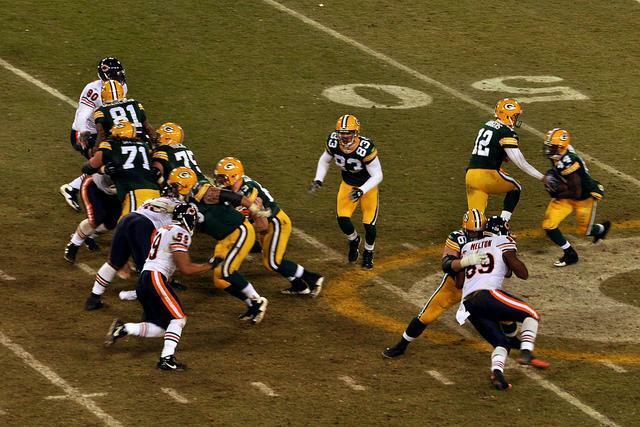 But if I were a betting man, 2011 will be Grant’s swan song in Green Bay. I believe James Starks showed enough in limited time that he will be taking that vaunted starter’s baton soon enough. The rest of the article is a matter of which perspective you take when viewing the construction of the facts about the second-year runner from the University of Buffalo. One of my favorite sports movies when I was growing up was Barry Levinson’s telling of the Bernard Malamud novel The Natural. Robert Redford plays Iowa farm boy Roy Hobbs. He can do it all on the baseball field., but before he gets a chance to become the next great pitcher, the real world drags him down the rabbit hole. Years later, Hobbs resurfaces older and wiser, but no longer a pitcher. However, Hobbs still has the rest of his skills intact and he literally announces his better-late-than-never arrival by literally knocking the cover off the ball with his first at-bat. What I love about this movie is the sense of mystery and the way the back story of Hobbs gives you a hint of “what could have been,” every time you watch him. Frank Gore is the football personified version of Roy Hobbs. Former Miami head coach Larry Coker once said Frank Gore was the most talented back he’s been around since Barry Sanders when he recruited Sanders during his stint as Oklahoma State’s running back coach. I watched Gore at Miami before his first knee injury and I understand why Coker held the 49er in such high regard. Every time I watch Gore in San Francisco, I can’t help but wonder what could have been if his original knees made it to the NFL. A shoulder injury sidelined Starks for his senior year. With no chance to build on a strong junior year, his draft stock took a nosedive. Starks got injured early in training camp and missed most of it. He was placed on the PUP list and did not see the field until Week 13. Starks’ debut against the 49ers in week 13 was an 18-carry, 73-yard performance. The Packers coaches wanted to see better effort in practices and he saw fewer opportunities on Sundays. He had a total of 11 carries for 28 yards for the next month of the regular season. Starks became the lead back in the Packers committee during the playoffs, tallying 315 yards on 81 carries (3.9 ypc) and a touchdown, including a 23-carry, 123-yard performance in Philadelphia. These are the facts. However depending on your perspective, the conclusion you draw from these facts can vary widely. If you take the facts at face value with a bottom-line perspective, Starks was little more than a necessary stop-gap for the Packers. Brandon Jackson has not developed into a consistent interior runner and John Kuhn is nothing more than a valued situational player. When Ryan Grant was lost for the season, Starks and Dimitri Nance were the only two viable options left to try. Starks demonstrated more productivity and consistency, but he was the lesser of two evils – both evils being rookies rushed into duty because of injury and ineffective play from veterans. The facts were this: Starks was a late draft pick because he had multiple injuries that kept him off a football field for nearly two seasons and because he was a former quarterback, he was still learning to play the position. Starks wasn’t statistically impressive with the exception of the Eagles game and arguably the debut against the 49ers. His quickness, decision-making, and pass blocking weren’t consistent when he was on the field. If you choose to look at the bottom line then your view could be that James Starks lacks starter upside and there is little question that a healthy Grant, or maybe draft mid-round pick Alex Green, will outplay Starks. In other words, James Starks is more like Samkon Gado than a future starter. I understand that point of view. I just don’t agree with it. This line of argument lists all the necessary facts, but it lacks depth of analysis. There’s no analysis behind the facts. I’m aware that accounting for the “why’s” can lead to over analysis. However, not addressing the why’s can lead to decisions that lack foresight. Let’s look at the same facts from Context A: Starks was a late draft pick because he had multiple injuries that kept him off a football field for nearly two seasons and because he was a former quarterback, he’s still learning to play the position. Starks wasn’t statistically impressive with the exception of the Eagles game and arguably the debut against the 49ers. His quickness, decision-making, and pass blocking weren’t consistent when he was on the field. These may be the facts, but think about the context behind them. Starks out-performed veterans Jackson and Kuhn despite missing nearly two years of football. The Packers relied on Starks, a player who missed 95 percent of his first training camp as a pro and all of his senior year, during the most important games for this organization in over a decade. Starks may not have been consistent with his performance, but he was still the better option over players who were in multiple training camps, practiced, and played with the the team for years. Wouldn’t this lead you to consider that Starks’ lack of consistency stems from not practicing and playing for nearly two years and not a lack of skill? Even if you argue that Starks’ work ethic was called out late in the regular season, wouldn’t it also be safe to assume that Starks did enough to correct that problem to satisfy the Packers coaches, earning their confidence to rely on him in three playoff games and a Super Bowl? If it isn’t a safe assumption that Starks improved his work ethic then wouldn’t the use of Starks despite a questionable work ethic would indicate that his talent was too great for the coaching staff to bench him during the playoffs? Either way you view it, you’re looking at a player with better than average skill. It leads me to believe that as long as Starks works hard, the rust will come off. As a result, he’ll process the game faster and his quicker reactions will allow him to play to his physical potential. Remember, Starks is also still new to the position and he gained nearly 20 pounds of muscle between the end of his junior year and his rookie season in the NFL. In other words, the Packers leading playoff rusher last year was basically playing a new position in a new league with a new team and essentially in a new body. That’s a lot of change for player. Given those circumstances I’d say he performed well. 0:06 Pad Level/Yards After Contact: This is just supposed to serve as an slick intro to the highlight package, but notice how Starks initiates contact with the Eagles defender. One of the big misnomers about pad level is that the runner always has to be running at an angle that isn’t upright. Jim Brown, Adrian Peterson, and Eddie Georgie ran with an upright stride, but they understood how to bring the lumber at the right time. Watch how Starks uses his free arm to ward off the wrap attempt of the defender. Now watch Adrian Peterson demonstrate the same technique in this instructional video. Did you see the similarity with the way both backs used the forearm to finish off? 0:15 Pad Level/Yards After Contact: Again, watch Starks use the forearm combined with the lowered shoulder to finish off the DB at 0:26 of this play. Then take note of the leg drive and turn to get an angle to plow forward while wrapped. Michael Bush, a much more vaunted prospect who was a former quarterback when he came to Louisville, needed more time to incorporate these concepts into his game than Starks. By the way, the replay shows the defender who bounced off Starks’ leg in the hole and failed to wrap him was All-Pro LB Patrick Willis. 1:00 Decisiveness/Vision: This power play offers a few options for Starks. He correctly focuses on the Eagles’ one-technique (the right defensive tackle playing between the center and right guard), who tries to cross the face of the center and gets double-teamed by the center and right guard. If you pause the highlight at Starks’ exchange with quarterback Aaron Rodgers, you’ll see the center peeling off the double team of the right defensive tackle and taking on the middle linebacker. Fullback John Kuhn enters the hole to block the strong side linebacker as the second fullback Dimitri Nance runs through the other side of the line to attack the weak side `backer. Starks has three options, but the center-guard double-team of the one-technique is the ideal path. Starks trusts his right guard to generate a push on the one-technique and he hits the hole hard enough to get past the one-technique and middle linebacker as designed. Running up the middle and reading a double team correctly and decisively takes patience and good judgment. The replay actually shows how Starks pressed the hole to the left and then veered back to the middle to give his double-team time to work. Starks’ press widens the hole and allows him to run downhill. Starks then breaks a tackle in the hole with good pad level. The fact that he’s running downhill into to defender also makes a difference that cutting to one side or the other might not. Starks then sheds another wrap attempt at his legs for extra yardage when he reaches the secondary. 1:41 Economy of running style/Acceleration/Pad Level: Watch the small stutter-cut Starks uses to set up the hole at left end and then the burst he has to the edge to reach the flat. There wasn’t a lot of delay with the movement, but his movement was enough to freeze the inside pursuit so he could burst past them to the outside. When he reaches the secondary, Starks ends the play with low pad level to get under the oncoming hit of the defensive back. Although the ball security could have been improved – Starks has the ball under his outside arm – he had the ball high and tight for much of the play. 2:14 Acceleration – For a back close to 220 pounds, Starks exhibits good burst to the corner. This should tell you that the added 15-18 pounds of muscle hasn’t hurt Starks’ speed, but it has given him more stamina and power. This is a back with the physical skills of a starter. 2:23 Patience/Balance/Leg Drive – This play is similar to a variation of a wind-back play that the New Orleans Saints ran with great success last year. I analyzed a Monday night match up with the Minnesota Vikings last year that featured this strategy. The play boils down to the Saints fullback crossing the formation and blocking the backside defensive end – a sometimes overaggressive Jared Allen – opening the backside for Pierre Thomas to gain positive yardage. The play is designed to work against a hard-pursuing defensive unit. On this play the Packers fullback on the right wing crosses the formation to left end while the rest of the offensive line slants right. Starks takes the exchange heading right and does a good job of initially selling the run in that direction. But watch how he works his way back to the left and dips between blockers to find the hole that the wing back sealed to the outside. This is a patient run. With more reps and acclimation to the game, Starks’ vision should only get better. Again, we’re talking about a runner with almost a two-year layoff. Starks also finishes this run with good balance, bouncing off an initial hit to his waist, getting his pads low, and driving forward with his legs in constant motion until the play dies. 2:32 Vision/Agility/Pad Level – If you have these three qualities as a runner, odds are you’re going to have the skills to contribute to an NFL team. Starks demonstrates before the exchange with Aaron Rodgers that he sees the penetration of the right defensive tackle crossing the face of the right guard and this move helps the defender push the offensive lineman into the backfield. Instead of overreacting and trying to bounce the run to the backside, Starks correctly reads the center picking up the run-stunting right defensive end. Starks stays with this block by pressing the hole that his center opens and then weaves behind that block with a nice dip to avoid getting grabbed in the backfield. He finishes the run with good pad level into the safety, keeping his legs moving to drag the defender for another four yards after contact. 2:37 Decisiveness/Pad Level – This short-yardage play, a 2nd and 1 versus nine Falcons defenders in the box is successful because Starks turns what goes wrong at the line of scrimmage and makes it right. The Falcons get strong penetration from the left defensive tackle coming down the line in backside pursuit. This prevents Starks from cutting inside the center-right guard double-team of the right defensive tackle. The right cornerback does an excellent job of getting penetration up field he shoots under the fullback, clogging the outside lane. The result of the defensive end’s backside pursuit and the cornerback shooting from the edge appears to block the primary and secondary options of this play design and Starks is forced to go east west. Note how quickly Starks gets outside and then his decisiveness to get his pads down hill and across the line of scrimmage after he has to hurdle the fullback/cornerback sprawl. Getting downhill as quickly as he did allowed Starks to knife just enough to the inside of the unblocked defender at the line of scrimmage and get his pads low to drive forward for the first down yardage. A tentative runner doesn’t do this. Nor does a converted quarterback lacking RB concepts. This is an attitude run. Even if it isn’t an inordinately physical run that we often see in these short yardage situations, Starks decisions have the urgency you’re seeking from this situation. He doesn’t forget that he has to get downhill even when the two best options were initially well defended. 2:48 Patience – Watch Starks take an outside press of the block his fullback makes at the left side of the line. This initial veer outside sets up the direction of the block and then affords Starks a larger hole to the inside for a first down and more. What these highlights didn’t show was Starks in pass protection. He will need to continue developing his skills. I think his greatest area of focus as a pass protector will be processing defensive looks and reacting accordingly. Starks did show the ability to get his feet and shoulders square, deliver a solid punch, follow up with a second punch, and then generate a push to control his opponent. He did this well enough in some of the biggest games in the recent history of the Packers. But that conversation about Green can likely wait a little bit (2-3 years Wisconsin Time). Great stuff. But wasn’t “The Natural” authored by Bernard Malamud? Good points but Edgar is now coaching the WR’s.